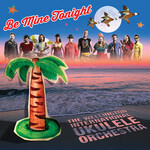 Making great Kiwi songs even more singalongable, Be Mine Tonight is a winning collection of many of our nation's best-loved tunes reinterpreted in the band's unique ukulele style. The album is sure to surprise and delight with its characteristically unpredictable mix of well-known contemporary and classic songs. It features special guests including Lisa Tomlins (fresh off a world tour with Neil Finn), Hawaiian ukulele artist Pi'ikea Clark and Canadian ukulele star James Hill. The Wellington International Ukulele Orchestra are renowned for their unique combination of charming humour, disarmingly small instruments, sublime musicality and hilarious audience participation - a joyful formula that has been in hot demand worldwide.